When you are starting out to trade, you’ll be inundated with myriads of forex indicators which can get you confused if you are not well informed. However, you don’t need all those indicators to be successful as a trader. All you need is to identify the best ones and learn about them. As soon as you’ve done so, you’ll already be on your way to succeeding in the market as a trader. We have provided in this article; the best indicators that as soon as you’ve learn them, you will already be on your way to trading like a pro. Although we have provided the best and most popular trading indicators, a good point you need to remember is the best one for you will always be an indicator that suits your trading style and psychology. The implication of this is that there is no one indicator that suits all traders’ styles. We will get into greater detail on each Fx indicator down below. The best way to start out and succeed as a forex trader is to simplify your trade strategy. This gives you a clear direction of what you need to do and help you succeed. Loading your platform with lots of complicated trading indicators and strategies would confuse you and reduce your overall success. For simplified trading, you need a trading plan which incorporates chart indicators and a number of trading rules that illustrates to you how you can make use of those indicators. In line with this, we have provided the best indicators below. You need to use them; one or two each time to help you figure out entry and exit points when trading with them. There are lots of fundamental factors to consider when determining the value of a currency in relation to the other currency. A lot of traders love to use charts to make it easy to sport trading opportunities through the trading indicator. When reading forex charts, you’ll notice two widespread market conditions. Through the use of technical analysis, you’ll be able to identify if the market is trending. Technical analysis allows you to identify when the market is ranging and when the market is trending and then discover better potential entries or exits using the chart information. Indicators are as easy to read as it is to incorporate them into forex trading chart. 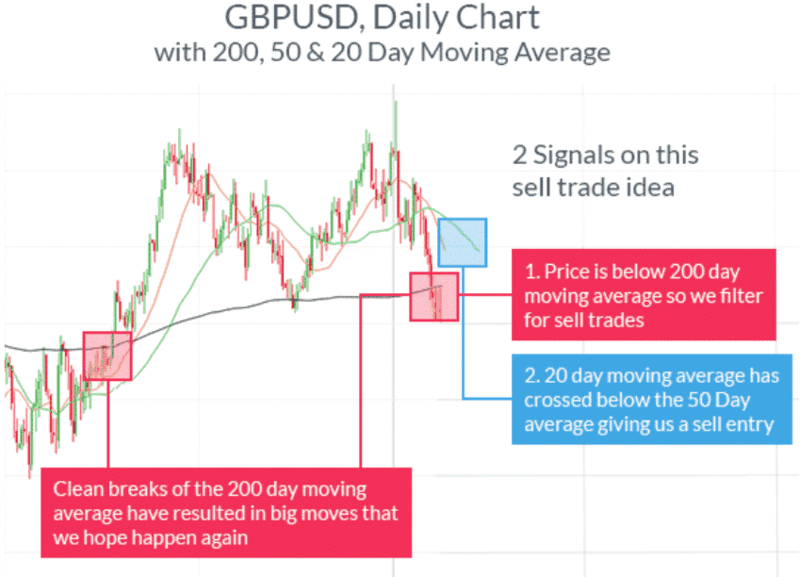 One of the popular and finest trading indicators that are suitable for all types of trading strategies is the moving average. Moving averages make it simpler for traders to identify trading potentials in the same direction as the trending market. When the market is trending up, you can make use of the moving average or multiple moving averages to figure out the trend and discover the great time to make your buy or sell order. The moving average is a charted line that merely estimates the average price of a currency pair across a specific length of time, such as the last 100 days or one year of price action to give you an idea of the general market direction. The aim of making use of the mean (average) is to level out the effects of price movements for better identification of the trend. A simple moving average (SMA) is the average price for a definite time period. It simply indicates the arithmetic mean. For instance, the 20-day moving average is the average (mean) of the closing prices for the last 20 days. The SMA is a lagging indicator. It adds prices from the past and offers a signal after the start of the trend. The lengthier the time period of the Simple Moving Average, the better smoothing effect it would have on the price and the least will its reaction to the changes in the market be. Because of this, the SMA is not your best choice of Forex indicator for superior warning of a movement. However, SMA is the best indicator for confirming a trend. The indicator commonly functions with averages estimated from one or more set of data including one or more, shorter time period and one long time period. The common values for the shorter SMA may be 10, 15 or 20 days while the standard values for the longer SMA may be 50, 100 or 200 days. You may wonder then when it normally posts a signal of a trend. The SMA sends a signal for a trending market when the long SMA crosses over the shorter SMA average. The longer SMA passing beyond the short-term average may be able to be an indication of an imminent uptrend. When the long-term average gets underneath the short-term average, it could be signaling the start of a downtrend. You can conduct a test with varying period lengths to discover what your best options are. You’ll discover that a trade proposal was created above just by incorporating a few moving averages to the chart. Discovering trade opportunities with moving averages helps you to view and trade off momentum by entering the market when the currency pair moves in the same direction of the moving average, and exiting your trade when the currency pair begins to trend in the opposite direction. The exponential moving average is similar to the simple moving average. However, it concentrates on the most recent prices. This implies that the exponential moving average (EMA) will react faster to price alterations. Standard values for long-term averages is 50-day and 200-day EMAs. 12-day and 26-day EMAs are mostly used for short-term averages. An uncomplicated system of trading with double moving average is to trade every time the two moving averages cross each other. You buy when the shorter moving average (MA) crosses above the longer slower MA, and sell when the shorter Moving Average moves beyond the longer moving average. Trading with this system ensures you will constantly have a position. You’ll either go long on the currency pair or short it. When to a trade exit? You’ll exit your trade if the shorter Moving Average moves across the longer Moving Average. You then place another trade in the opposite direction to the trade you have immediately exited. This gives you a great way to efficiently square and reverse. If you are not planning to trade the market constantly, the combination of the short-term and long-term moving averages would not serve as the best Forex indicator for you. In a situation like this, you’ll be better off with a mixture of indicator that includes a third time period. A triple moving average strategy makes use of the third Moving Average. The lengthiest time frame serves as a trend filter. When the shortest Moving Average crosses the middle one, you’ll be able to place a trade order. You’ll only need to place long trades when the two shorter Moving Averages are beyond the longest Moving Average and merely go shot when the two shot MAs are both under the longest Moving Average. 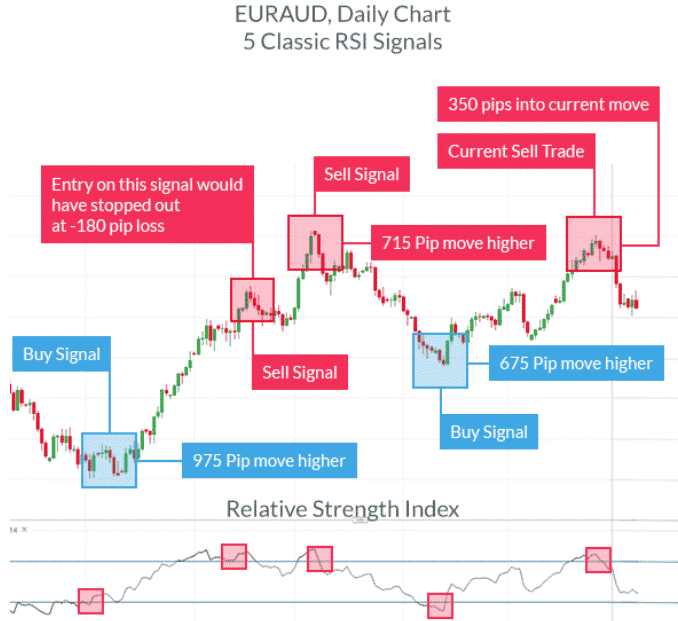 The Relative Strength Index or RSI is a simple oscillatory indicator that has a very useful application in forex trading. Oscillators such as the RSI assist you to establish when a currency is overbought or oversold and indicates an imminent reversal. It is the best option of trading indicator for traders who love to ‘buy low and sell high’. The RSI is useful in both trending and ranging markets and helps traders to easily identify better entry and exit locations. When the markets direction is not trending but ranging, you can take either buy or sell signals as shown in the chart above. During the period of trending markets, it becomes clearer the direction to trade and it is better to trade in the direction of the trend when the indicator is retracing back from extremes. Given the oscillatory nature of the RSI forex trading indicator; it is plotted with values ranging from 0 and 100. The value of 100 is taken to be the overbought position and it indicates an imminent downward reversal. On the other hand, the value of 0 is regarded as oversold and an indication of an imminent upward reversal. If an uptrend has been revealed, you would want to discover the RSI reversing from readings under 30 or oversold prior to the point it starts to move back in trend direction. The best forex trading indicator list commonly include volatility channel of one type or the other. A volatility channel is a different tactic for discovering a trend. It makes use of the idea that when the price moves above the moving average and adds an extra amount, it may be an indication that a trend is imminent. 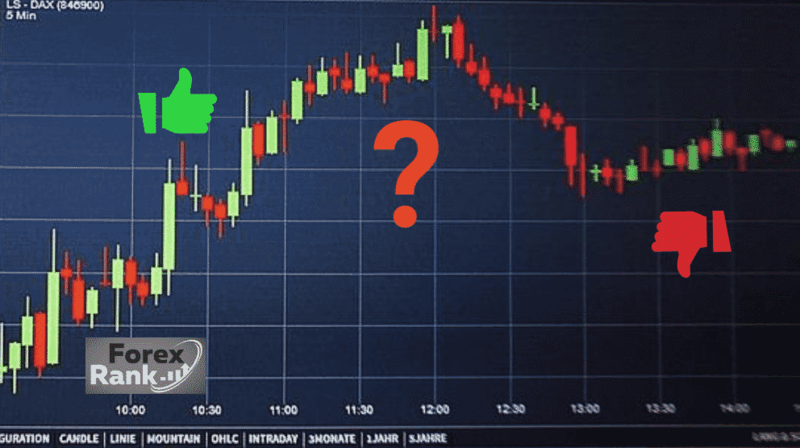 A Bollinger band is a volatility channel developed by financial analyst John Bollinger over three decades ago but it still rates among the best forex indicators for trading with different volatility channel strategies. The number of days for the moving average and the number of standard deviations the trader wants the band positioned away from the moving average. The most widely used values are 2 or 2.5 standard deviations. In statistics, the standard deviation is an estimation of the distance between the values of a set of data. In finance, standard deviation serves as a method of estimating volatility. A Bollinger band commonly adjusts according to the volatility that exists in the market. It gets wider with an increase in volatility increases and gets narrower with a reduction in volatility. A long-term trend-following treading strategy commonly making use of Bollinger bands may utilize two standard deviations and a 350-day moving average. You would commence a long position if the preceding day’s close is beyond the top of the channel, and go short if the preceding day’s close is below the base of the band. Your exit position ought to be when the preceding day’s close moves cross back via the moving average. 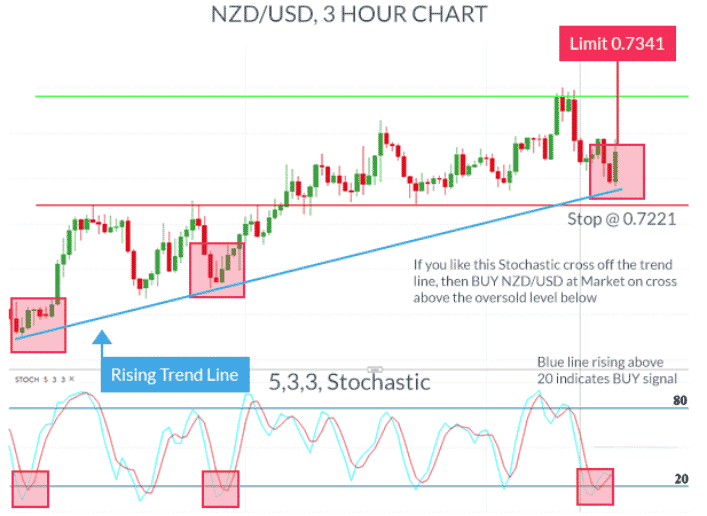 Slow stochastics are an oscillator similar to the RSI that can assist you to establish an overbought or oversold setting, possibly making a price reversal. The exclusive part of trading with the stochastic indicator is the two lines, %K and %D line that’ll serve as an entry indicator. Given the fact that the oscillator has the same overbought or oversold readings, what you need to look for is merely the %K line that crosses beyond the %D line via the 20 level to spot a solid buy signal in the trend direction. 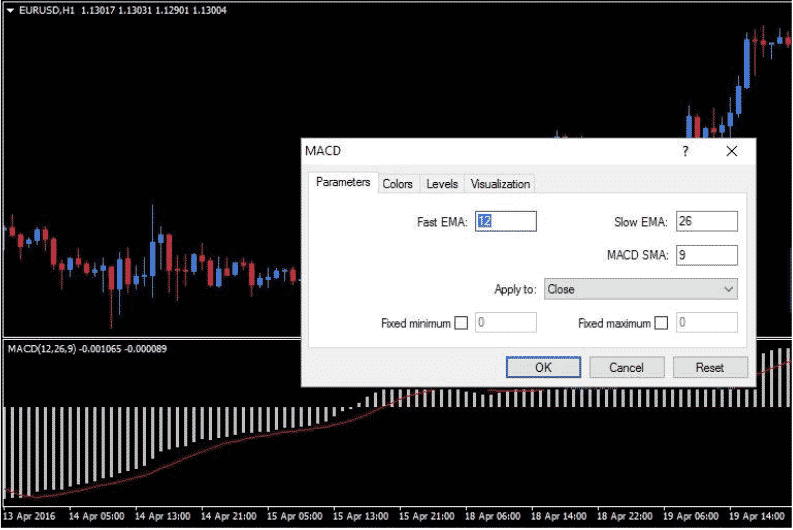 The moving average convergence/divergence (MACD) is a Forex indicator structured for detecting momentum. It helps you to identify a trend and as well helps to estimate how strong the trend is. When you are looking for the best indicator to determine the strength of a market trend, MACD is your best option. The indicator is based on the estimation of the divergence between a faster EMA and a slower EMA. The indicator traces two lines on the price chart. The MACD line is basically estimated by subtracting the 26-day EMA from the 12-day EMA and after that, the 9-day EMA of the MACD is plotted as a signal line. When the MACD line makes a cross underneath the signal line, it gives you an indication to place a sell order. When it crosses underneath the signal line, it signals to you to sell. You can position the three parameters (26, 12 and 9) anyhow you want. Just like the moving averages, you’ll be able to discover the best setting for you by experimenting. The MACD is occasionally referred to as the king of oscillators. It works well both in trending and ranging markets because it makes use of moving averages to offer a visual display of alternation in momentum. When you have figured out whether the market is ranging or trending, there are two factors that serve as a signal for this indicator, you’ll be required to discover. The first one is to identify the lines in connection to the zero line which spots an upward or downward bias of the currency pair. The next thing to do after that is to discover a crossover or cross under of the MACD line (Red) to the Signal line (Blue) for a buy or sell trade, correspondingly. Similar to other indicators, the MACD works best when attached with a known trending or ranging market. As soon as you discover the trend, your best bet is to take to take crossovers of the MACD line in the trend direction. When you’ve entered the trade, you can position stops under the current price extreme before the crossover, and situate a trade frontier at two times the amount you risk. When you are searching for the most popular forex trading indicator, it must be the one that is most suitable for your needs and trading style. It may be better for you to make use of a combination of indicators. You make one a primary indicator for identifying a trend and make use of the second one as a filter to confirm the trend. It would regularly tell you whether the market condition warrants trading or not.